We have added a new service to our list of professional services. We are now an authorized U-Haul Dealer so we can meet your moving needs and temporary accommodations all at the same time in one place. Should you need a place to stay over night after packing up your belongings, we have you covered. You will be entitled to receive $10.00 off any rooms you book the same day you rent your uHaul Truck or Trailer from us. We know that your move can be a hassle sometimes so our goal is to making sure your uHaul reservation, pickup and drop off from our location goes as smooth as possible for you. One of our friendly Staff will see to it that any questions you have will be answered before you leave our location. Our goal is to make sure you leave with a handshake, laugh, and or smile on your face and ready to face the task of your move. We will personally assist you with auto transport or trailer hook-up and make sure all safety functions are in place, help adjust the mirrors and so on before you leave. 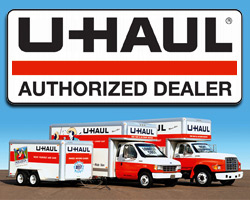 Get the support you need by watching these helpful uHaul Videos here on our pages.